Another fascinating Castle on this amazing coastline - a little to the South of Wick. Those navigating at sea also know it as “The Old Man of Wick” – a comforting landmark indeed with a long and noble history. This “artistic reconstruction” shows how the castle would have looked in the late 1500’s. It was painted by Andrew Spratt who used recent photographs of the castle site as a template to superimpose the original foundation plan of the castle - effectively rebuilding it section by section. It is difficult to imagine at first glance of the remains, that this gaunt solitary structure was once the integral part of an extensive and ancient fortress. It stands on a narrow spit of rock dramatically jutting out into the sea with steep cliffs and deep geos on either side. The castle site was cut off from the mainland by not one, but two, defensive ditches making the castle practically impregnable in its time. The keep still stands to three stories today but there was another storey above. The unvaulted basement contained the kitchen and stores; the first floor would contain the hall with the entrance door at the South East. The upper floors, as was usual, would contain the Lord’s private apartments. 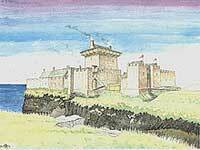 It is probable that the battlements would have had protective hoarding as shown on the reconstruction drawing. This afforded the defenders protection from arrows and missiles whilst allowing them to drop obstacles to the base of the keep upon anyone managing to penetrate that far. The windows consisted of narrow slits – only one per floor in the keep. Beyond the keep was a small courtyard leading to a long narrow passageway that passed along the centre of the peninsula, with buildings on either side. These would contain barracks; brew house, chapel, store-rooms, offices, etc. The whole site beyond the second ditch was protected by a defensive barmkin wall, which enclosed the keep and also formed the outer wall of the buildings to the rear. The foundations of these buildings can still be seen today. The barmkin also formed an enclosure at the head of the peninsula, which may have been used for growing vegetables or as a courtyard. The formidable approach to the castle was by way of a drawbridge over a broad ditch cut into the rock. A substantial gatehouse and outer wall protected the drawbridge and ditch. The gatehouse permitted access to an outer ward, which may also have contained stables and a smiddy. Access to the inner ward of the castle was across a second ditch by drawbridge, with machicolation above. An efficient design indeed, with any attackers gaining access through the gatehouse, being easily disposed of in the outer ward from the battlements and hoarding. The Castle of Old Wick was one of the numerous strongholds of Sir Reginald de Cheyne who occupied it in the earlier part of the 14th century. Upon his death around 1345 it passed to the Earl of Sutherland by virtue of his marriage to Sir Reginald’s daughter. The Oliphants, Sutherlands of Duffus, Glenorchy and Dunbars of Hempriggs subsequently owned it until it was abandoned in the 18th century. There is little doubt that this castle site is one of the oldest in Caithness and there is evidence to suggest that the ancient earls of the Norse line occupied defensive fortifications here 800 years ago. Miller - Historic Castles and Families Of the North - Caithness Field Club Bulletin Oct. 1976.